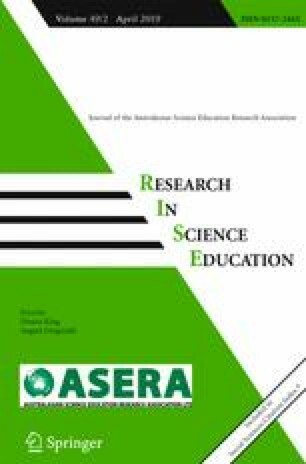 The purposes of this study were to identify middle school student representations of phase change, explore how they interpret textbook representations, and compare student and textbook representations of phase change. A total of 21 middle school students (12 sixth-graders and nine eighth-graders) voluntarily participated in the study. 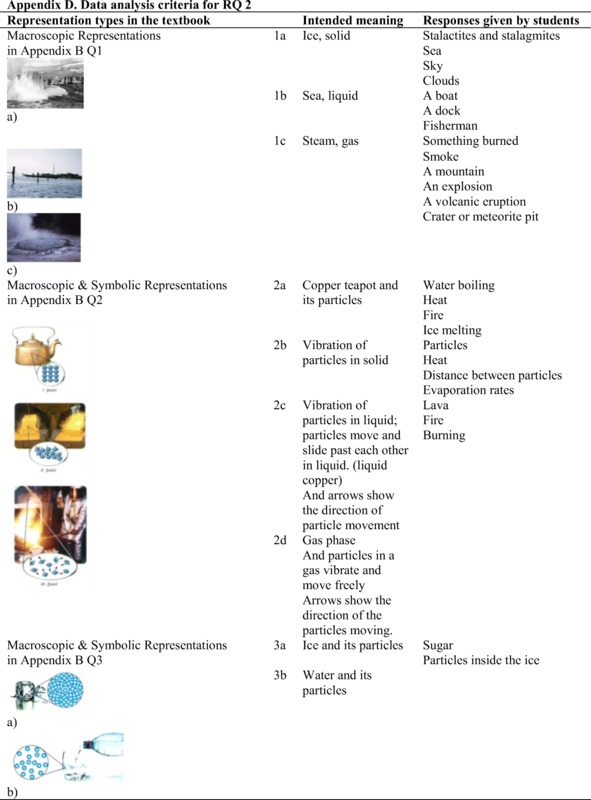 Semi-structured interviews with each participant were conducted in order to identify students’ representations of phase change of matter and explore how they interpret the representations of phase change in their textbooks. Findings indicated that students’ representations of phase change mostly do not match the criteria for a scientific understanding of phase change. Moreover, student interpretations of representations seem to be different than the intended meanings of the textbook representations. Finally, the student and textbook representations are similar in terms of the types of particles and the distances among them, while they are different from each other in terms of the motion of particles. 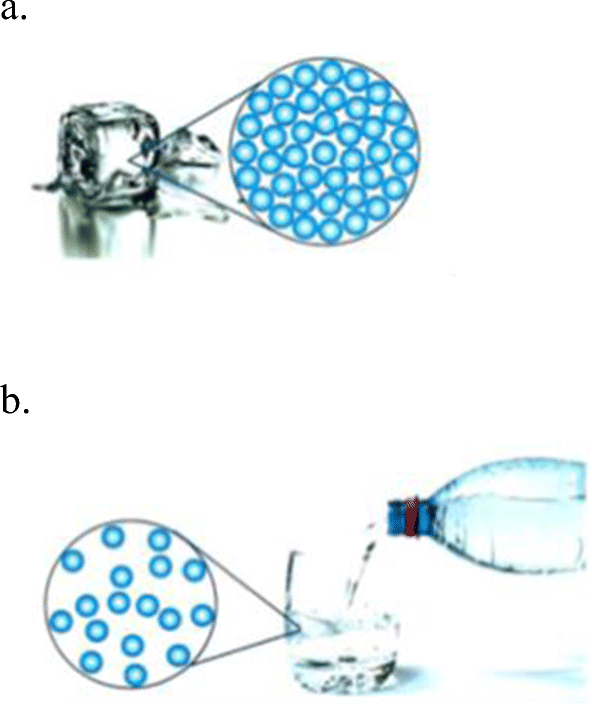 Textbook representations do not seem to help students understand the distances and the motion of particles during phase change. Students need more guidance than that provided by textbook authors and more class discussion to understand the language used by teachers and textbook authors. How do you understand the term “matter”? How would you define matter? Could you give me some examples of matter? What are the common characteristics of these examples of matter? What would you think will happen if we heat up a bowl of water? What would happen if we put some water in the refrigerator? Could you tell me more what could happen during these changes? How can we name these changes? Could you draw the particles during the phase change? Could you explain your drawing please? Could you tell me what you see from the following pictures? What do you understand from these photos*? What is in the first picture? What does the picture tell us? What is in the second picture? What does the picture tell us? What is in the third picture? What does the picture tell us? *These pictures were taken from the middle school science textbook used at the time of the study (Lider, p. 85). Could you tell me about what you see from these pictures? What are the lines seen in the first circle? What are the lines seen in the second circle? What are the arrows showing us? What is happening in the third circle? What does it tell us? Could you describe what you are seeing from the following pictures? Phase change is a physical change. A physical change in a substance does not change what the substance is. All matter is made up of particles. There is empty space between particles of solids, liquids and gases. Particles of solids, liquids and gases are arranged differently. Particles of solids, liquids, and gases are in constant motion. (Particles of a solid vibrate but generally do not move from place to place. Particles of a liquid vibrate, move about and slide past each other. Particles of a gas vibrate and move freely at high speeds. The particles of the matter are not changed during the phase change. Students’ drawings of particles in terms of type [shape] are not changed during the phase. Students’ drawing of particles of solids, liquids and gases are in constant motion. Students’ drawings of particles of solids are closely packed in a fixed order. Students’ drawings of particles of liquids are closer to each other. They are not regularly packed. They take the shape of a container. Particles of solids and liquids are spaced similarly. Students’ drawings of particles of gases are separated by relatively large distances. They fill the container. Barke, H. D., Hazari, A., & Yitbarek, S. (2009). Misconceptions in chemistry: addressing perceptions in chemical education. https://doi.org/10.1007/978-3-540-70989-3_1, Springer-Verlag Berlin Heidelberg. Ministry of National Education (MNE) (2013a), Science education curriculum for graders 3, 4, 5, 6, 7 and 8, retrieved from http://ttkb.meb.gov.tr/www/guncellenenogretim-programlari/icerik/151. Ministry of National Education (MNE) (2013b), Chemistry education curriculum for graders 9, 10, 11 and 12, retrieved from http://ttkb.meb.gov.tr/www/guncellenenogretim-programlari/icerik/151.